Special copolymers of PAN, plasticizers, thermal stabilizers and other additives are blended and fed into the extruder where they are plasticized and extruded in monofilament form. Soon afterwards this monofilament is cut into pellets which are the most suitable intermediate product for the manufacturing of all possible forms with THERMPAN and which can be used in conventional extruders. 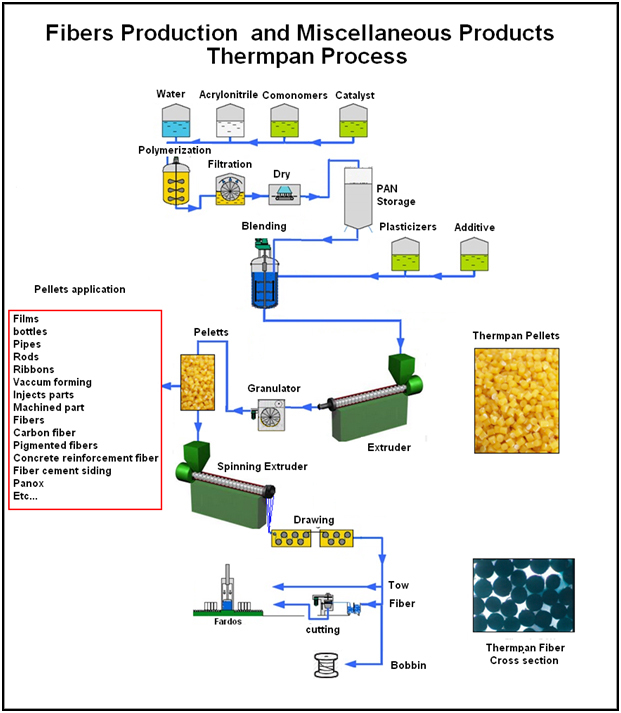 For example, for fiber production, the THERMPAN pellets are fed into an extruder containing at its outlet a gear pump which pressurizes the molten polymer in the die containing a desired number of holes and diameters of the order of 100 to 500 μm. After leaving the spinneret, THERMPAN fibers should be cooled and drawn for increased toughness. A lubricant is then applied and the fibers can be cut, winded or marketed in the form of cables.